A South American native, experts believe the Argentine ant was introduced to North America via coffee ships from Brazil. Shallow nests about eight inches deep located in moist areas under boards and stones, beneath plants, along sidewalks, etc. In dry soil, nests can be up to 24 inches deep. Nests are usually located near a food source, but they will forage up to 200 feet away. Argentine ants are often recognized by the large numbers trailing back and forth to the colony. These ants move indoors when weather is either very wet or very dry, and when there is not enough honeydew in the area. Indoor nests are usually near a moisture source, such as water pipes, sinks, etc. Colonies have a few hundred to several hundred thousand workers and many queens; typically about 10 percent queens and 90 percent workers. While mainly a nuisance pest by their presence (dead or alive), they can mechanically transmit disease organisms because they crawl over garbage, sewage and dead and decaying animals. Light or dark brown. Workers measure 1/16 of an inch (2.2-2.8 millimeters) long; queens about 1/8-1/4 of an inch (4-6 millimeters); and winged males about 1/16 of an inch (2.8-3.0 millimeters) in length. Well-established in California and southern United States; however, can be introduced anywhere by truck shipments of infested goods. Sweets, such as sugars and syrups, insect honeydew, plant and fruit juices; but will also feed on whatever is available. Development (egg to adult) averages 74 days. 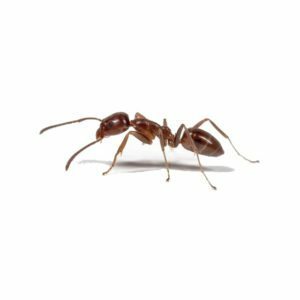 The workers are aggressive and usually eliminate other ant species and some other insects from the nest area. Multiple queens and large colonies make control very difficult.